The mobile Pad requires you use fullscreen mode due to browser size restrictions. Unfortunately, we require things that Safari doesn't support. Please upgrade to another browser that supports modern web standards. Welcome to the new ChalkySticks Pad! If you prefer the old version, you can access that here. You have successfully saved this diagram! Removing: Drag to any pocket and release. Use the keyboard arrows to fine-tune the placement of balls. When drawing lines, you can click a ball to attach the line to that ball. Removing: Hover over lines and press backspace OR click and hold for 3 seconds. Press "A" on the keyboard to toggle arrows. Press "L" on the keyboard to toggle line styles. Click the Lines menu on the left to see options for colors, massé, and more. Starting lines near the end of another will connect them. It creates a joint between the two that you can drag around. 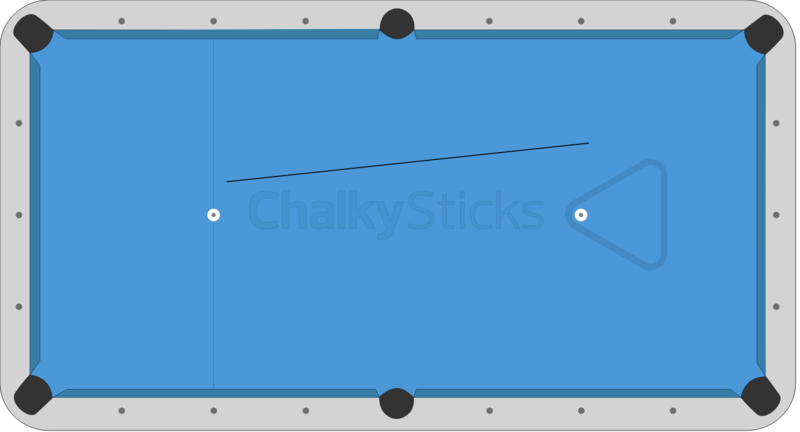 Clicking a ball will connect a line to that ball. Removing: Click text and follow dialog instructions. You can resize text field by dragging textbox lower right corner. Removing: Drag shape to overlap any rail. Resizing: Open Shapes menu on left to show resizing tool. Removing: You can't remove one yet. Click the Cues menu on the left to see options for rotation, style, and more.